Jack McCain is a former detective and now a scientific analyst with the Australian Federal Police in Canberra. 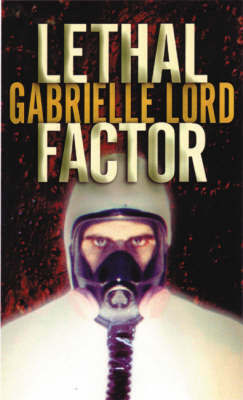 In Lethal Factor, the second novel in which he has featured, he is involved with several cases simultaneously including the brutal murder of a nun in a local convent and the death of a fellow scientist from what is thought to be anthrax. McCain’s personal life causes almost as much drama as his work and in this installment his daughter is threatened by a crooked ex-cop and McCain’s ex-wife makes claims that he once sexually abused his daughter. As I mentioned when I discussed Lord’s first novel Fortress one of her strengths is the research she puts into her subjects and once again this is evident in Lethal Factor. There is lots of science in this novel and Lord has incorporated a good amount of realistic detail, including the depiction of the time it takes for rigorous scientific testing processes to be completed properly (i.e. the book takes place closer to real time than CSI time). There really is a lot going on in this novel and as none of the cases really overlap it probably stretches the bounds of credibility a little to think that one man would be involved in so many disparate cases, especially as he has a habit of going out to conduct interviews as he would have when he was a detective and seems to spend half his time driving between Sydney and Canberra (roughly 3 hours each way). Still, none of the threads become lost and they are all quite fascinating. Although the initial set pieces of each case are ‘ripped from the headlines’ dramatic ones, the resolutions are all realistically domestic in scale, concerning age-old human foibles like vengeance, greed and envy. Ten years ago when I read the first book in this series I was probably a lot less forgiving than I am now about the fact that Jack McCain does not always do the right, or even legal thing but as I get older I find it easier to accept these types of flaws and consequently I liked Jack more in this novel. I also liked the depiction of his 18-year old daughter Jacinta who seemed to strike just the right balance of childishness and maturity. I do recommend Lethal Factor as a top-notch scientific procedural with a complex, intriguing plot. For those overseas, who might struggle to find this novel you could try any of Lord’s standalones or perhaps one of the four books from her series featuring Gemma Lincoln who heads up a private security firm. This entry was posted in Aussie Readers Summer Reading, Australia, book review, Gabrielle Lord (Aus). Bookmark the permalink. This sounds good. I don’t think my library has her books, but I will check around and with our mystery store, Partners and Crime, a great place. PS, sorry, should have written, will check out Death Delights, first in this series.